A necklace to impress an empress! Called "Ming shards", these encased ceramic pendants offer unique and serendipitous compositions of painted beauty. 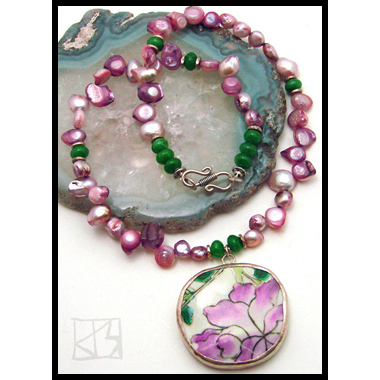 This pretty floral in lavender-pink and green is balanced on a strand of genuine baroque pearls. 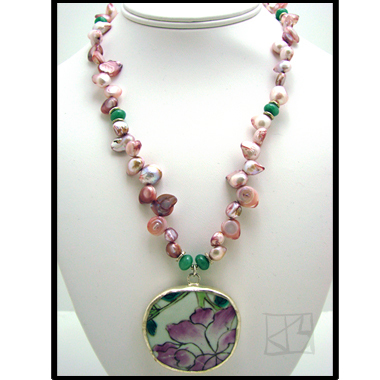 These, I think, perfectly balance the pendant's flowers as their color is also concentrated toward the outer edge. The strand is punctuated with jade and Thai Hill Tribe silver, and the necklace closes with a Bali sterling clasp.